I was saddened to read in Prolific North recently that the Whitby Gazette is closing its offices in the town after 164 years. Although the paper will continue to be published, it will be edited by one member of staff from home, with a group editor having overall responsibility, writing for newspapers up to 92 miles apart. This is a very real sign of the times. Since 2005 more than 200 local papers have closed in the UK and the number of regional journalists has halved to around 6,500. As a result many staff are working from centralised newsrooms, often many miles away from the local communities they serve and the press are far less likely to attend council meetings and courtroom hearings. There is an estimated 58% of the UK population that has no daily or regional title and this is particularly the case in rural areas, which have become increasingly reliant on national media and their own social networks for local news. It has been pointed out that in some recent tragedies, such as the Grenfell Tower fire where 72 people lost their lives, there were repercussions from a lack of local press. In that case, the nearest local newspaper - The Kensington and Chelsea Chronicle - closed in 2014. After that, the area was covered by a single journalist working out of a newsroom based many miles away in Surrey. A 2016 study found UK towns, whose daily local newspapers had shut, suffered from a "democracy deficit" where there was far lower community engagement and an increased distrust of public bodies. 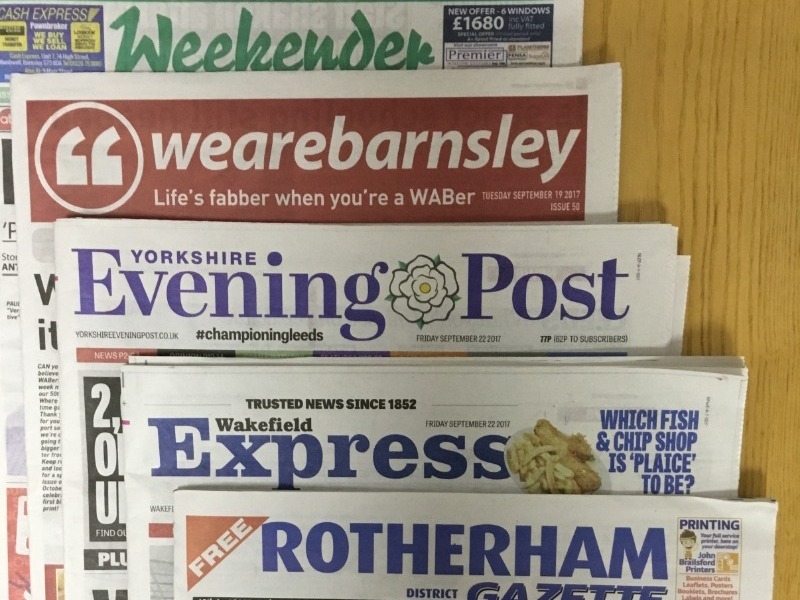 When local papers are closed down or shifted into a main city or town regional version, as has happened with some papers in South Yorkshire over the past few years, people lose their opportunity for a local voice. Prime Minister Theresa May launched a Government review into the sustainability of local press in February 2018, where she praised the work done by local journalists in covering the terror attack on the Manchester Arena, in which 22 people died. The coverage, by the Manchester Evening News, was, she said, "a very good example of where good quality local journalism and a good quality local paper can actually be out there supporting their community". Many have pointed out how local newspaper decline is a threat to democracy and could be fuelling a rise in fake news. The decline of local newspapers is largely due to a fall in advertising revenues, so it is not an easy one to tackle. Editors work tirelessly in often very difficult and demanding conditions to produce accurate, concise content, working against strict deadlines to ensure the news is correctly represented and reported. If local newspapers are to survive they need to retain their advertising revenue, which must come, mainly from local businesses, who recognise the value of good quality local press reporting. In our local area, several newspapers have either gone online only or being lost completely – the South Yorkshire Times and the Star, which used to have separate editions for Barnsley, Rotherham, Sheffield and Doncaster, are now all rolled into one, the Barnsley Chronicle has stopped producing its separate local area editions, too. Other titles that have disappeared in the last few years include the Dronfield Advertiser, Eckington Leader, Sheffield Gazette, Dewsbury Reporter, Beverley Guardian, Oldham Advertiser and Glossop Advertiser, to name but a few. There are also fewer opportunities for Journalism graduates to get into the career they have trained for. We are regularly contacted by Journalism graduates who have found so few opportunities in local newspapers that they turn to Public Relations roles, where there are often better prospects. When in the past, you may have bought a local newspaper from a shop, be prepared to pay for digital content. We have seen the nationals, such as the Daily Telegraph, ask for a subscription for reading full stories online and a similar trend could be seen in local press. The decline in newspaper print sales has led to fewer newsagents willing to deliver newspapers. Why not start gathering a list of names and addresses of people in your local area (with their permission) who would like to receive a local newspaper on a daily or weekly basis and present it to your local news agent? This could be a very positive way to revert newspaper sales decline on a local level. Support local newspapers with advertising, but ensure that genuine news stories can still remain impartial. Some newspapers are turning to asking PR companies to advertise every time we send them through a press release. This is quite understandable, however we believe the editorial needs to remain impartial and should run on its own merits. We encourage our clients to advertise whenever they can in local newspapers and if all local businesses put aside even a small budget to regional newspaper advertising, this could have a very positive impact. If you would like to help reverse local newspaper decline, why not Like our Facebook page and message us with your own suggestions of what could be done. If you are a manufacturer, construction or b2b company and would like more help with securing press coverage in the regional, national or trade newspapers, please get in touch via hello@dragonflypr.co.uk or by calling 0114 349 5345. Dragonfly PR is a dedicated Sheffield based agency with over 15 years’ experience in helping b2b companies across Yorkshire and the North West to generate results. We can put together an outline proposal that will help you meet your business objectives, through generating sales enquiries, increasing traffic to your website and positioning you as the experts in the field.